Last night Alyssa and Charlie attended the Chesapeake Energy Father Daughter Ball. I left the office a few hours early to take Alyssa to the salon to get her hair done and a quick manicure. WOW....she looked radiantly beautiful. She and her Daddy enjoyed a dinner together in the Chesapeake restaurant, The WildCat, that consisted of chicken nuggets and mac & cheese. They know what those kiddos like to eat...hehe. After dinner she went on a carriage ride with her Daddy, Uncle Dave, and cousins Breezy & Bailey. Uncle Dave works at Chesapeake in the Operations department while I work in the IT department. After their carriage ride they headed to the dance. 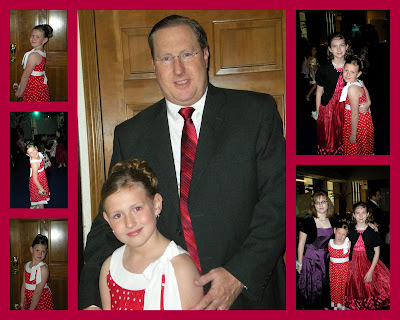 Alyssa and her Daddy practiced dancing for two nights before the ball and had fun cutting a new rug together. Alyssa wore a beautiful Red dress with white polkadots. What a great thing Chesapeake does for our families by offering these kind of special events. Aubrey McClendon, CEO & co-founder of Chesapeake and his wife stopped by to check out the girls & their Daddies. I know Alyssa will always remember her special evening with her Daddy. Alyssa looks so beautiful! Charlie looks pretty darn handsome too! I'm glad they had a good time. One of the most important things for a little girl is to have a relationship with her daddy.